Well Well Well, Diwali this year in India doesn't only brings crackers in your home but it also brings crackers on the cricket ground. 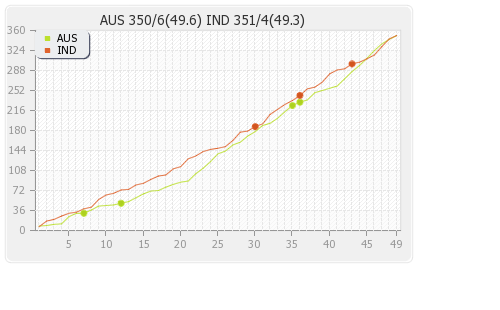 This India vs Australia ODI series has bring a flood of runs and cracking innings from many batsmen. First of all Happy Diwali to all the Indian cricket fans! India has defeated Australia remarkably in the 6th ODI to enter the 7th ODI with brighter chances to win the series. Australia and India are now leveled at 2-2 after six matches (with two matches affected by rain and ended in no result). India vs Australia live streaming can be enjoyed online in India on Star Sports. Star Cricket and Star Sports channels will telecast the 7th ODI live on TV in India. Sixth ODI at Nagpur brought loads of runs and again a nightmare for the bowlers. 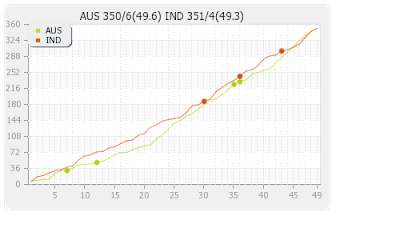 Australia set a score of 350 and India won it! Team India has been disappointing in terms of bowling but batting wise they are in mood to set new records in every match. In this same series earlier, India chased 400 plus and now they also chased 350! It almost seemed to be a repeat. A sensible remark from Dhoni came "It is actually not good for cricket that such big totals are chased pretty often nowadays". Right said, the game needs to also belong to the bowlers. Australia batted first and made 350. Big contributions came from Watson who scored 102 from 94 balls and Bailey who scored a big 156 runs in 114 balls! Voges scored 44 off 38 balls and helped Australia reach 350. But no score is safe score against the World Champions India. Indian innings got a flying start with Sharma and Dhawan. They scored 178 runs for first wicket when Sharma fell for 79 runs. Dhawan reached his ton this time and was bowled by Faulkner on 100. Kohli played another splendid innings of 115 in just 66 balls. He is in the best form of his life and looks unstoppable. Former cricketers have already started expecting him to near the century records of Sachin in ODIs. Kohli and Dhoni took India home in the end with 3 balls to spare. Here is a graph from the last match which proves how neck to neck these two teams have performed. It overall highlights the whole series and how competitive it has been! Let us hope for another cracker at Bengaluru as India takes on Australia for the seventh and the final ODI which would also be a decider! We can expect another big innings from Kohli as he would feel at home due to his frequent matches here for Royal Challengers Bangalore. India would love to enter the India vs West Indies test series with great confidence of a series win against Australian side.